NEW!! TWO VIDEOS ABOUT DEUCEHEAVEN! 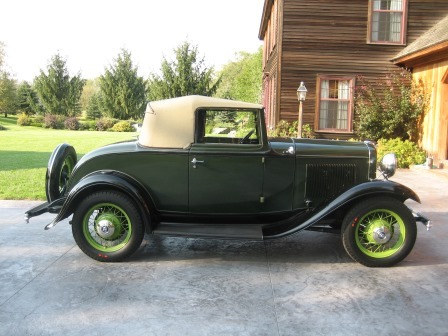 JUST CLICK ON THESE LINKS, AND YOU CAN WATCH TWO VIDEOS ABOUT MY '32 FORDS THROUGH MECUM AUCTIONS. Welcome to Deuceheaven! My name is Gene Hetland. 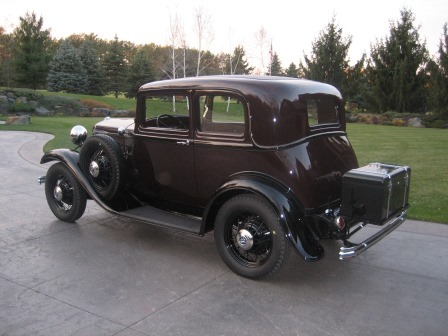 We collect and restore 1932 Fords, parts, and memorabilia. We live in the cold, liberal state of Minnesota. I have been doing this since I was fifteen years old. Now I am an old, cantankerous, 100% blue blood Norwegian. 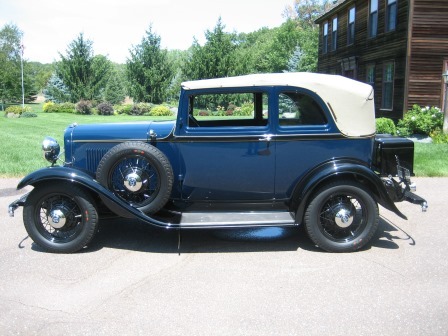 We have decided to create this website because the 1932 Ford is the most recognizable, iconic car in existence. Its lifespan will go on forever as it is a natural to become a hot rod or a classic because of its original design. There is no car that has been built in this post-industrial age where everything on a deuce has its place, everything fits, and the design flows from front to back. We have 20 1932 Fords from an original 19,000 mile unmolested Roadster to a fully restored 1,000 point Early Ford V-8 Club Convertable Sedan B-400. My collection has been seen in the Early Ford V-8 Club magazine, and three or four published books. This website will include pictures and details of my Ford collection. We buy 1932 Ford cars, parts, and memorabilia. We are looking for a Sport Coupe. You can email me through deuceheaven@aol.com. Please reference 1932 Ford in email. Thank you and we hope you enjoy this website! Please note the page menu at bottom of screen. Click on page number to access other pages. Also, check back for more pictures and info! 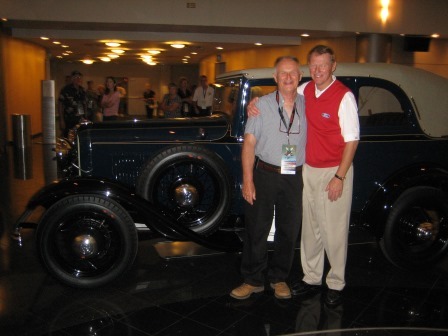 My B-400 in the Ford Rotunda at the 75th Anniversary of the 1932 Ford with Alan Mulally, President and CEO of Ford Motor Company. P.S. I'm the short Norwegian. Fully restored B-400 done by Mike McKennett at Restorations and Reproductions. The color is Washington Blue and it has N.O.S. BF Goodrich tires. My fully restored Victoria done by Mike McKennett at Restorations and Reproductions. The color is Medium Maroon with N.O.S. Goodyear tires. It has a potter trunk and duel side mounts. Note, all my tires have the logos painted on them. On two of my original cars, the color was still on the logos. If you also look at some old factory photos, you will note the logos have color on them. 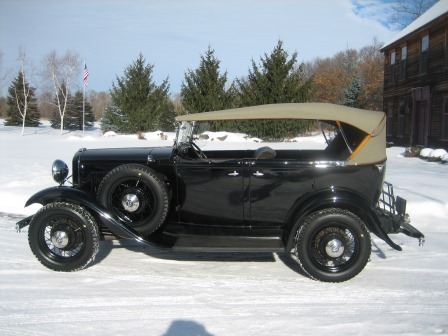 My 1932 Cabriolet is an original car. The paint and upholstery are original. The fenders have been repainted many years ago. The original tires are still on the car as are the rims which are apple green. The body paint is Brewster Green Light. The lower reveals and mouldings are Brewster Green Medium. The pinstripe is Silver. The car has 33,000 actual miles on it. I have replaced the top with original type materials. The motor had to be gone through as it had sat for 30 some years and not run. It is my finest example of the original cars that I have. My 1932 Ford Deluxe Phaeton has roughly 40,000 actual miles. The engine needed to be rebuilt. I put a new top on it. It has N.O.S. Goodyear tires, dual side mounts, and dual tail lights. Again, my 1932 Phaeton. 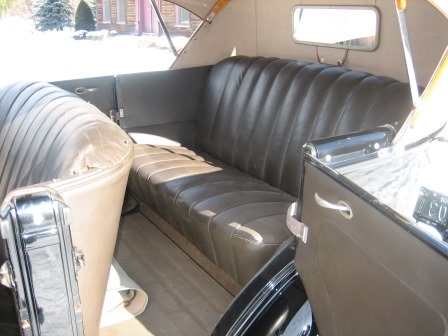 The interior is original leather. It only has a couple tears. The rear rubber floor mat is original. The front mat is one I purchased from Mike McKennett. 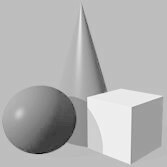 You have to trim them to size on your own, but they are correct in design and texture.